Hooray for Comics: My teacher is a werewolf! Alright kiddos! It's finally here! A book you've NEVER SEEN! Fugue Part 1. For digital reading and downloading. Enjoy book one, and if you REALLY liked it, you can purchase it at the store located to the right! The actual, factual copy has screen printed covers, super awesome packaging from yours truly and lots and lots of love! Be sure to buy one for your mom, your music teacher, your friends, and your daughters! 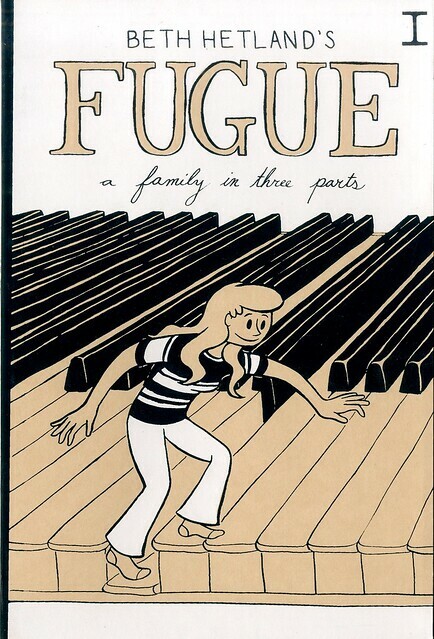 Soon to come will be the digital and order-able versions of Fugue Part 2. Which is available via flickr right now, but downloadable abilities are in its future. Things not comic related: I just got back from Belinda Cook (now Blakely)'s wedding and pal-ing around with some Chicago homies, and a really great Vermont homie. I bought a brand spankin' new laptop! And I'm getting my costume ready for the final Harry Potter movie... which I am seeing at midnight on Thursday. I can't tell you who I'll be, but you'll see pictures from the event, so stay tuned my little ones. Side note: WOW! 60 POSTS!! YES!! !